One of my all time favourtie and practical gifts for babies and toddlers is Blankets. You can’t have too many of these. I have already posted a tutorial on how to make these beautiful baby blankets HERE. The Giraffe minky blanket and the cat naps fleece blankets are half yard and they were prefect for an infant to use in the carseat/crib. The other 3 blankets were yard size and are great size for toddlers too. Like I mentioned in my previous post Fleece is my favortie fabric and at Joann Fabric you get a ton of cute prints and most of the days they are on sale. 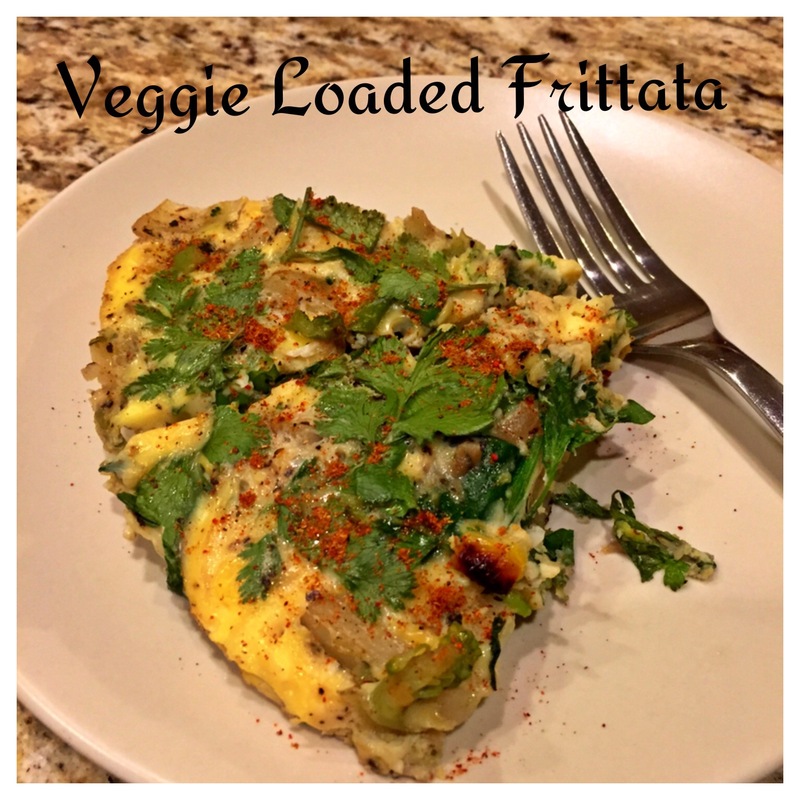 I am so excited to share a recipe that will get your kids to eat and love veggies. Here is an easy carrot & pea patties that are great for baby/toddlers. These patties are so versatile that you can serve them as a delicious savory breakfast, pack them in lunchbox or serve them for dinner. My 1 year old loves finger foods and she eats better if she feeds herself and she loves “Peas” and also asks in a cute way in every meal. 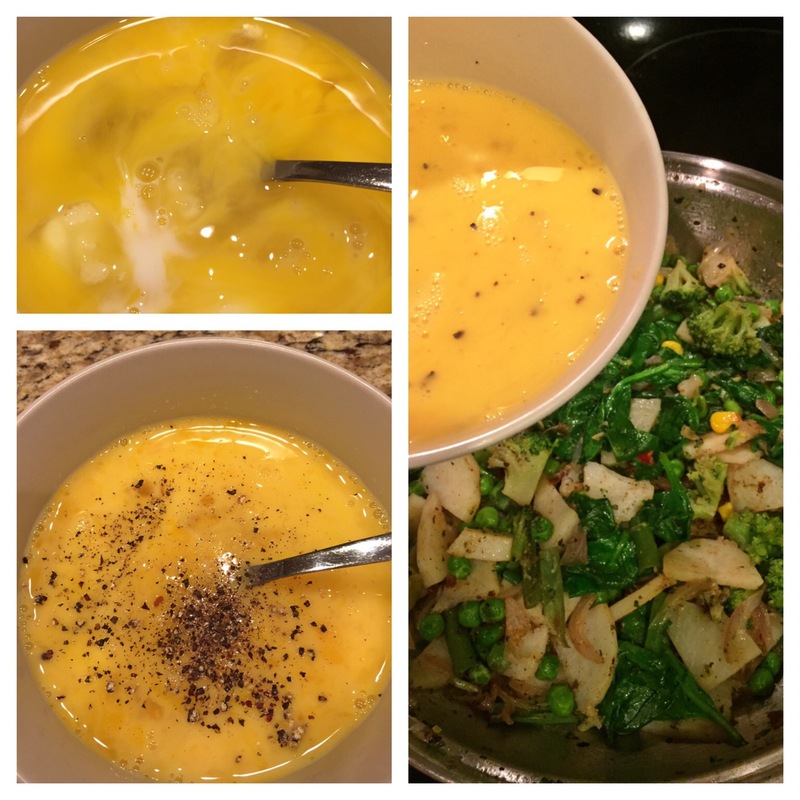 So, I had to come up with a recipe that is delicious and quick too. Yes, these are absolutely quick and all it takes is 20 minutes and 5 ingredients. 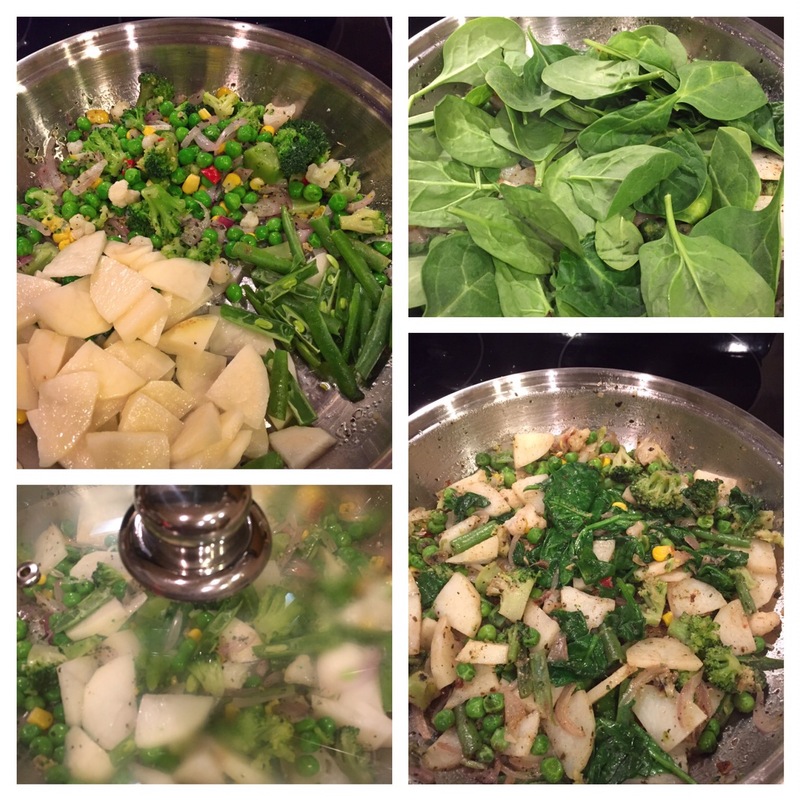 Mash up the steamed veggies, you can use almost any veggie of your choice. In a mixing bowl, add all the ingredients and mix together to form a soft dough. With the moisture from the mashed veggies you should be able to form it without adding water. Form them as patties and cook them in butter/oil of your choice over medium heat until golden brown, approx. couple of minutes on each side. Isn’t that quick healthy yet delicious treat for babies/toddler. For older kids serve with low sugar ketchup or dipping sauce of your choice. Baby burp cloths make wonderful and practical gifts. They are super useful and can be used in many ways. I made them as gifts and want to make for my little one too and it is one of the first baby projects I took up. The burp cloths I have done before for my niece and nephews and couple of other friends babies were just basic rectangle ones. However, this time I wanted to try a new pattern and I must say they were absolutely great and super handy and I still use them and they are always there in my diaper bag. They can be made in cotton or flaneel. Flannel are my personal favorite becoz they are soft on new born’s skin. You get 2 burp cloths from half yard of flannel using same fabric front and back. I love to use different prints front and back so you can use the half yard for 4 burp cloths. The fabric is from Joann, make sure to wash and press the fabric before using. I have used a free pattern available on pinterest, pick the one you find it easy to follow. Cut the flannel fabric (front and back) per the pattern and pin them together on the worng side leaving a gap along the opposite side of the inside curve. That opening is to flip the cloths right side out. Sew the edges leaving the opening. Once sewn cut off the excess fabric and flip the burp cloths right side out. Fold the excess fabric of the opening inside the burp cloth and pin them together and make a top-stitch all along the burp cloth. Isn’t that quick, easy and great baby gift! Introducing our bundle of joy – Sisira!! I am excited, anxious and terrified all at once to get back here and start writing. Its been more than an year and a lottt of changes have happened. I must say it has been a rollercoaster ride. I apologize that I have not shared my pregnancy news, why I didn’t post for long and lot of stuff that has happened in the past 1+ year. Finally, life is getting back to some certanity and I found time to get back to my passion. So, she is our first and my pregnancy has been a breeze but still I didn’t find time to blog! I was too busy enjoying my pregnancy and getting prepared for the baby and taking up DIY baby projects. Here she is – We named her Sisira ❤ and she is born on 21 February 2018 ( we named her after the season – Sisira ruthuvu). I can’t believe she is already 1 . Life took a huge turn with a newborn and before we were adjusting to the new change – my husband had to take up a new job in Portland, OR (of course, after a lot of thought and deliberation before or after the baby we decided to relocate after the baby is 3 months). It wasn’t an easy decision because we had to sell our house, our furniture ( we were planning to lease out an apartment) -it was a huge downsizing project. And my parents had to leave to India too, I was recovering from my surgery and Postpartum – it was the most stressful times of our lives and we survived! We will forever miss Arizona, our first home and place where Sisira is born, friends we made and everything about it! So, all this kept me/us super busy. I am happy to get back and can’t wait to share the tutorials of all the projects I made in the past year. Happy Monday and rest of the week ahead !! 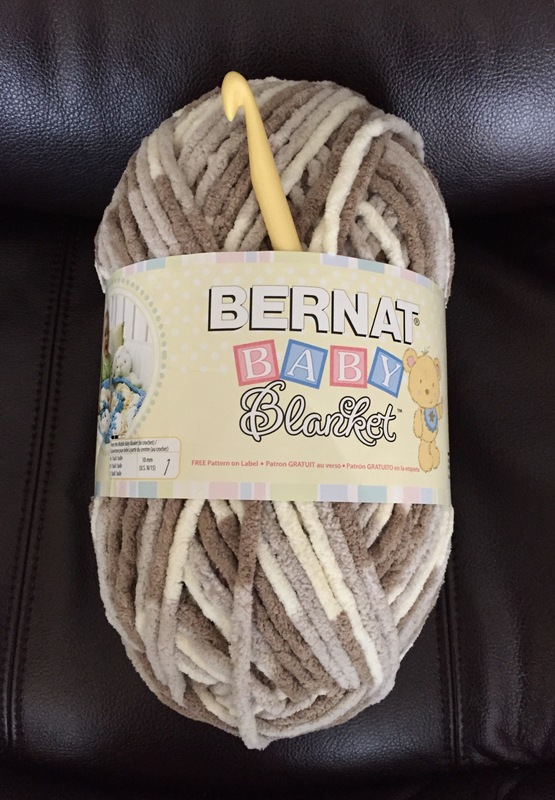 I loveee the Bernat Baby Blanet Yarn. 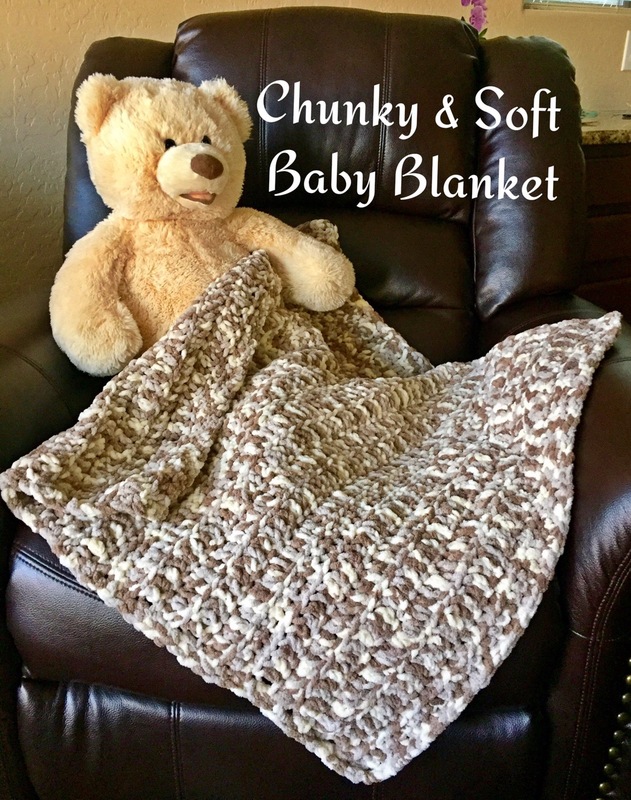 It makes a soft, lush and chunky baby blanket and is perfect as a car seat/stroller blanket. This blanket is special to me as I am making it for a new addition to our family. My sister is expecting a baby and she is due in December. They didn’t want to know the gender of the baby so made this neutral shade baby blanket. This is my first pattern that I came up with and has Chain stitch, Front loop Single crochet (FLSC) & Front loop double crochet (FLDC) stitches. Here is a tutorial to learn FLSC/FLDC stitch – click here. Finished blanket is close to 30in*30in and you need a Size 10 crochet hook. Step 1 : Foundation Stitch – Chain stitch 60 or equals 30 inches in length. Step 2 : Row 1- In 2nd chain from hook FLSC (Front loop single crochet) in every chain across and turn. Row 2– Chain 1 and repeat FLSC (Front loop single crochet) in every stitch and turn. 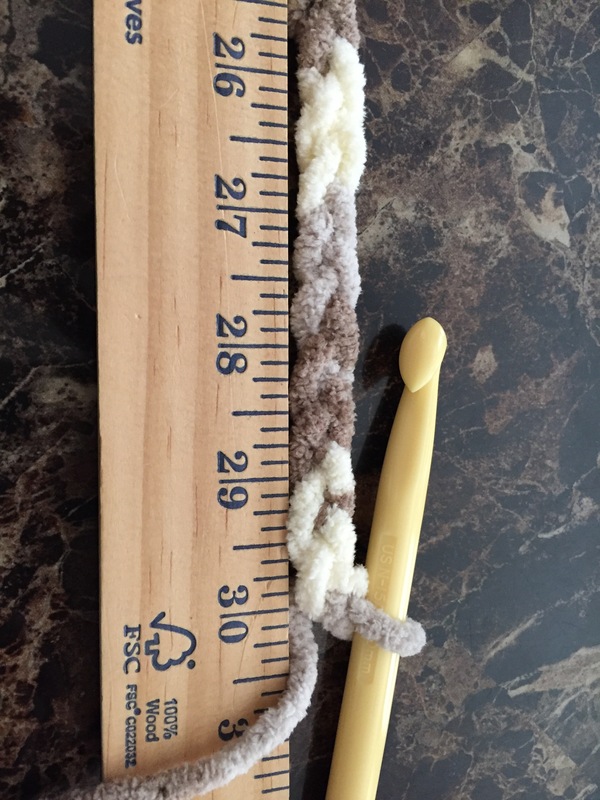 Row 3 – Chain 2 and FLDC (Front loop double crochet) in every stitch and turn. Repeat this for next 4 stitches and turn. 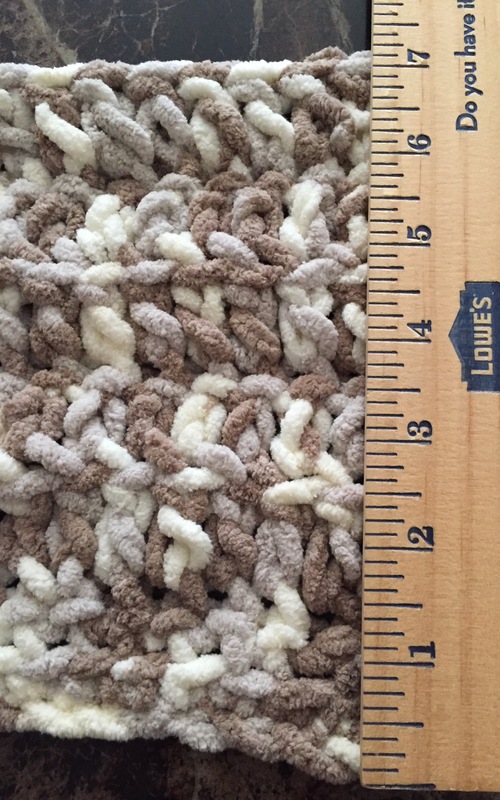 With this the width of the blanket will total to 7 inches. 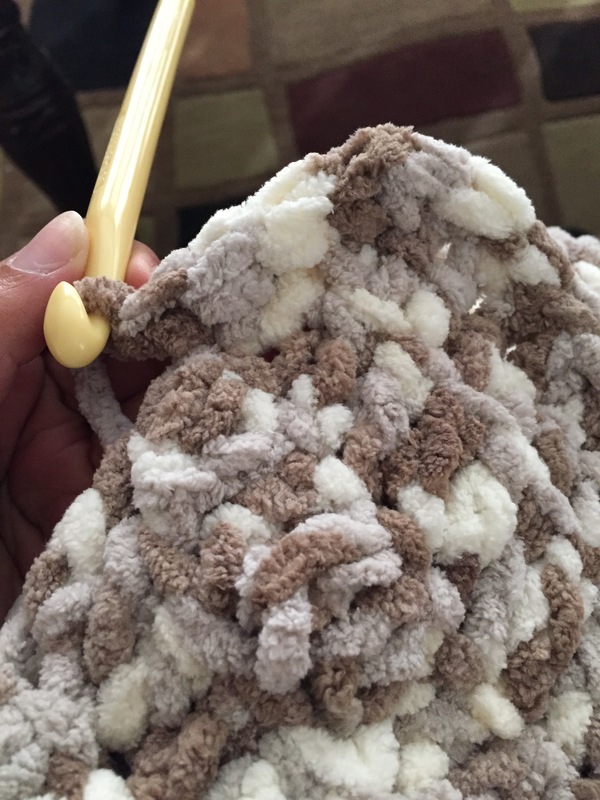 Step 4 – End the blanket by adding one more FLSC (front loop single crochet) and continue to make a single crochet stitch all around the blanket. That will be the finishing stitch and will make the total size of the blanket approx 30 in * 30 in. And that’s it you have a beautiful chunky and soft baby blanket ready. And I love the FLDC stitch because it creates a beautiful ridge pattern unlike DC (double crochet) stitch. 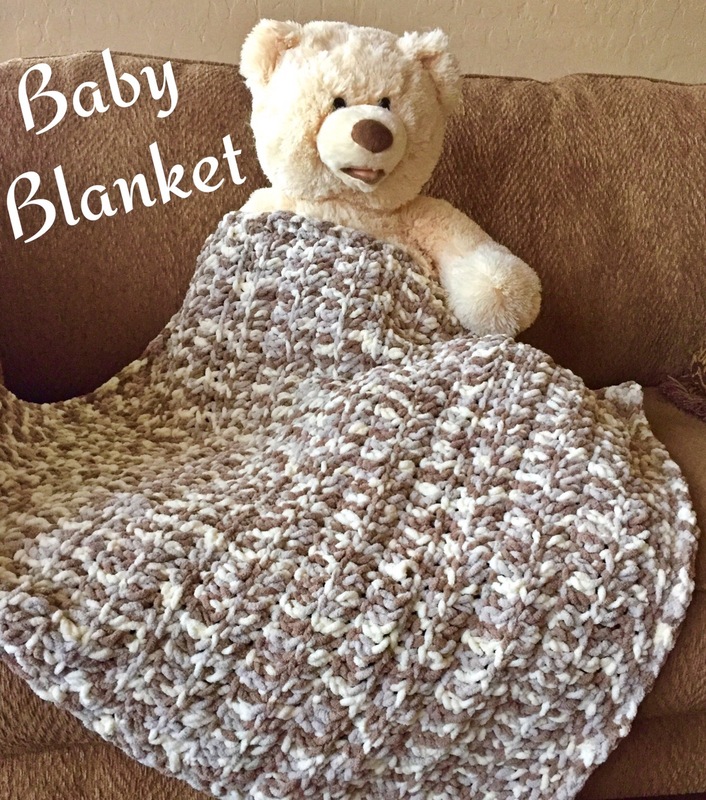 This blanket makes great baby shower gifts or new born and is super easy to work with. The total time took for me is 6-8 hours. It can be customized with any vegetables and add-ins (soy chunks/cheese) that you and your family prefers. Heat the skillet over medium heat and add some oil/butter and saute garlic and onions until the raw smell is gone and season with some salt, pepper and oregano. Add veggies and cook until tender covered on medium heat. At this point I add some Indian spices like garam masala/kitchen king masala for extra flavor. Once vegetable are cooked whisk together eggs, milk, salt and pepper. 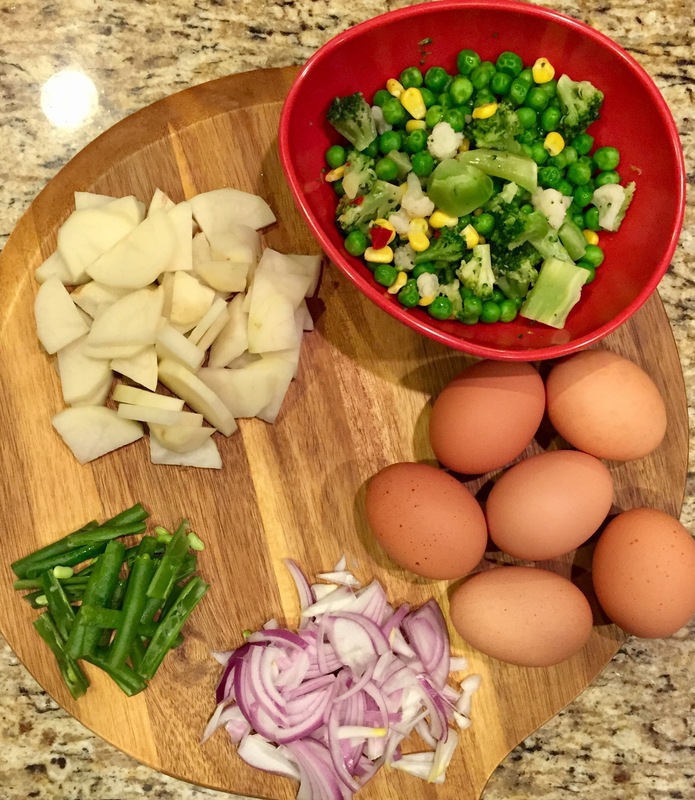 Arrange veggies evenly and pour the egg mixture over the vegetables. Now its ur choice to either cook it on stove or preheat oven to 400 F. If you want to cook in oven – make sure to use a oven safe skillet and place it into the oven for 10-12 minutes or until set. I find it easy to cook on stove. 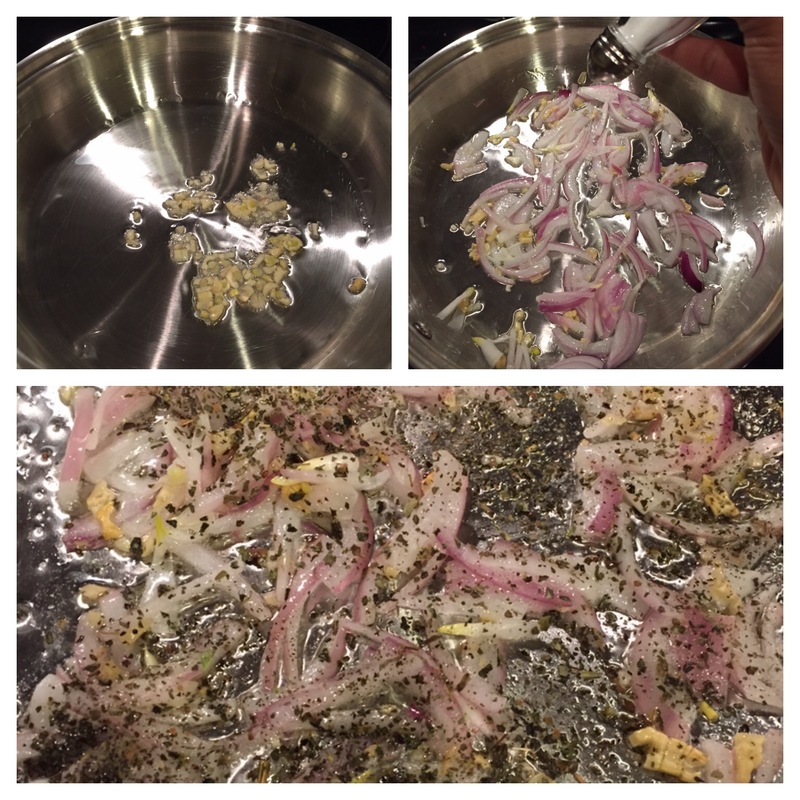 Sprinkle some fresh herbs of your choice and without stirring cover it and cook on medium flame for 12-15 minutes. It is easy to check when set – insert a fork and if it comes out clean it is done. Serve warm. They can be just hanged by themselves or create a focal spot by grouping them together. Or even can be used to place it on a surface like a table top. Well, I made these large festive lanterns for Sankranthi Bommala Koluvu ( Doll festival in January) to cover LED candles on the wood candle holders. 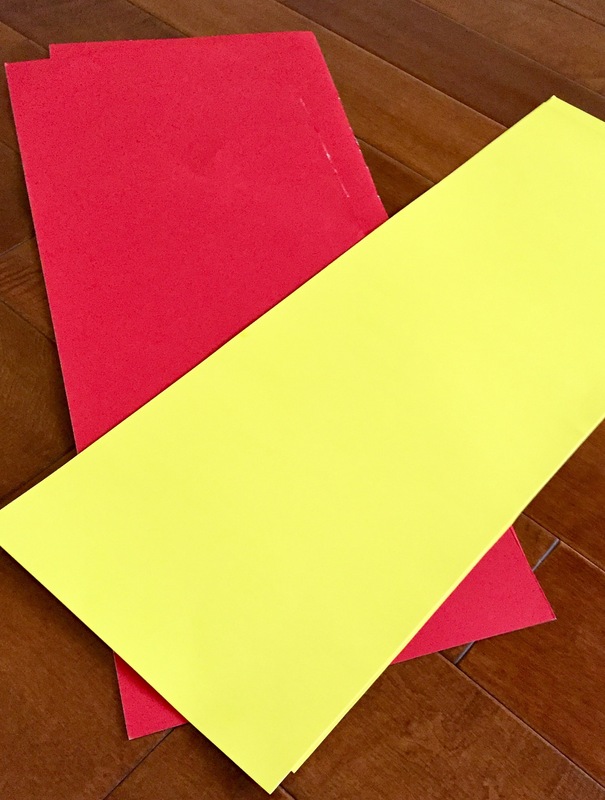 Step 1: Take 2 sheets of paper. I used the poster board (22×28 inches)from dollar tree . 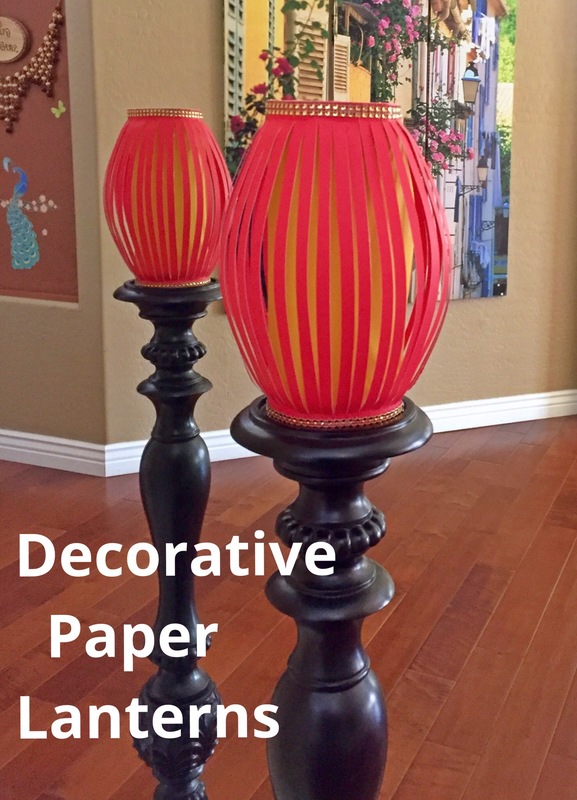 You can make 2 large lanterns 11×14 inch each. 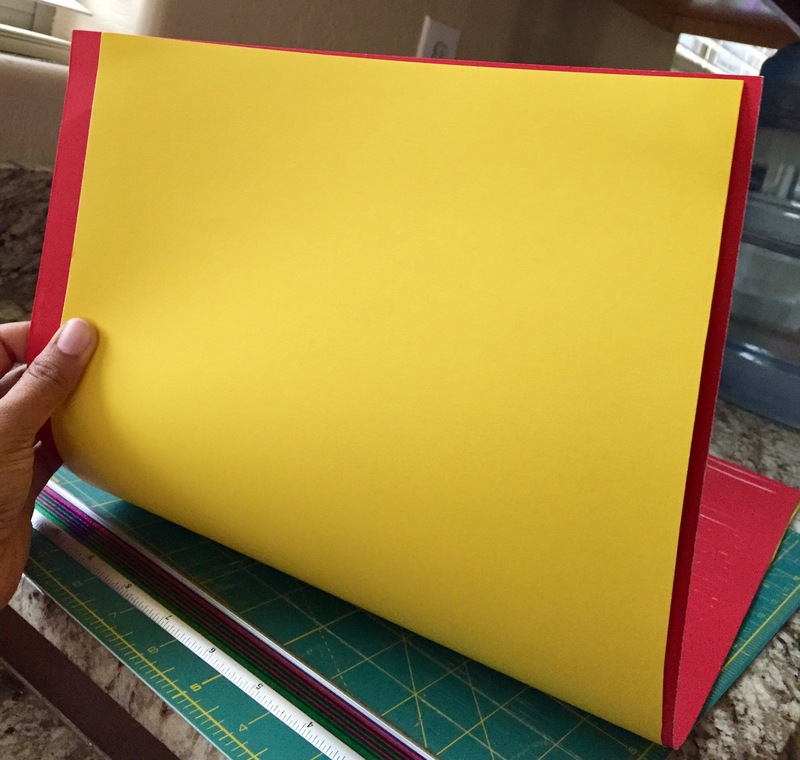 Step 2: Keep 1 sheet 11×14 inches and cut the other (contrast piece that goes inside as a tube) to 11X11. The tube length should be couple of inches shorter than the outer design sheet. 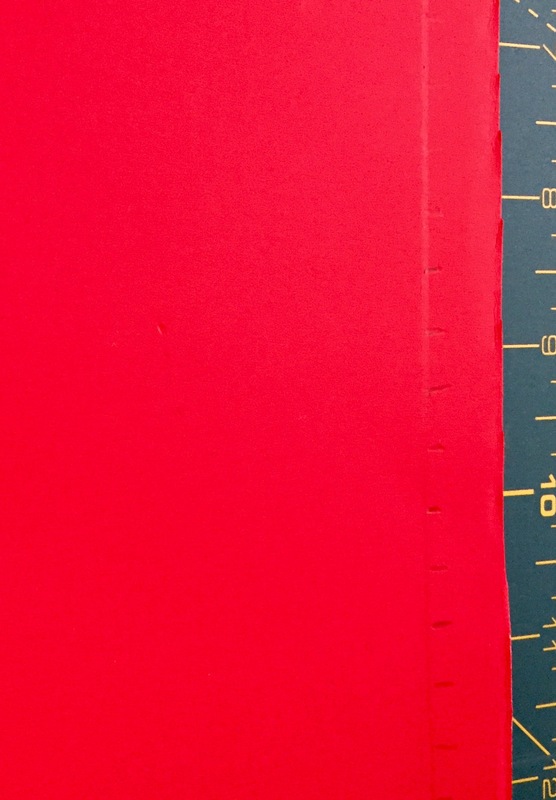 Step 3: Out of contrasting colored sheet mark 1 inch from the bottom of the sheet and draw a line. And on the line mark 1/2 inch dots all through on both the sides. Step 4: Using a craft knife cut it lengthwise 1/2 inch apart from one end of the marked point to the other end. Carefully separate the strips and Glue the ends to the inside contrast sheet. Fold the sheet to form a cylinder and carefully pull and bend the strips to form different shapes like below. Step 5: Glue the rhinestone trims to the both ends of the lantern. Step 6: Punch holes at each end of the lantern and add a satin ribbon to hang it on. Aren’t they beautiful and versatile. 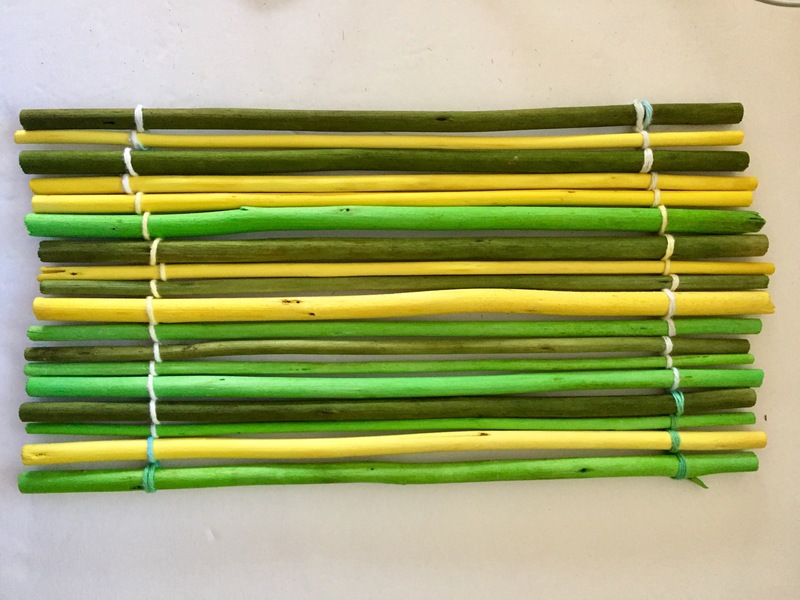 Today I am going to share this bamboo sticks mat woven from the scented decorative sticks available @ IKEA. They are in 4 fun colors and I can’t wait to make more projects with these bright n colorful ones. 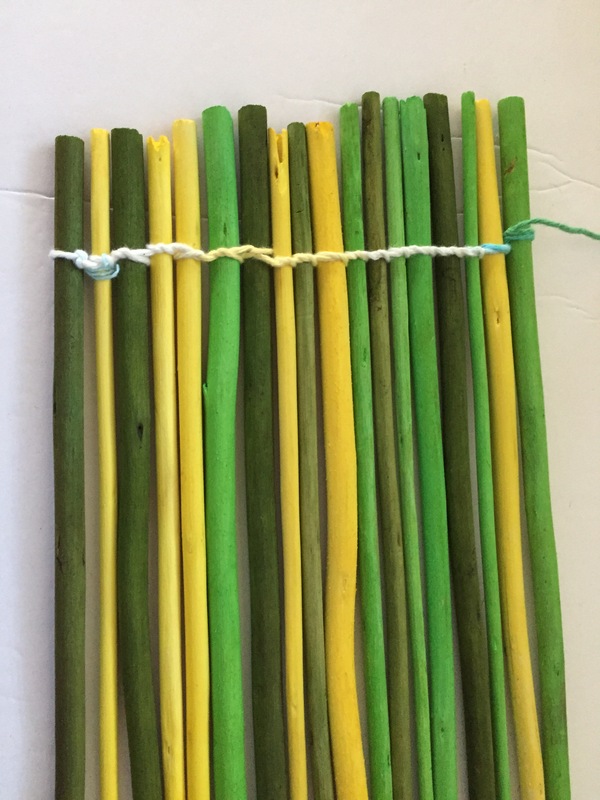 The packet has 20 sticks priced @ $1.99 and many months ago I randomly picked them and have been waiting for the right project. Inspired from sushi mat and ikeahackers.net I gave it a try and it worked perfect. Step 1 : Arrange the sticks making sure they all lay flat. Step 2 : Take a piece of yarn double the size of the width of the sticks and make double knot on the first one. My love for miniatures made me buy the ducks used in this project. They are chopstick stand/holders that I bought in Singapore(China town) just before moving to United States. After we moved to US (2012) while unpacking I looked all my bags but couldn’t find them. And in 2015 when we were moving from rental to our new home I was packing bags and found a small secret zip pocket on our suitcase that I have completely forgot about. And I saw 2 bubble wrap pieces. I thought it is trash and almost about to throw it away and it suddenly stuck me …….. Step 1: Take a cardboard that matches the size of the moss sheet. Use school glue or modpodge and glue it to the cardboard. Step 2: Mark a boundary for rocks and glue using hot glue gun. I made this for Sankranthi Bomalla Koluvu 2016 and displayed it as a little pond with a fence. And this year for one of krishna’s stories – krishna playing flute in brindavan. I am super excited to share Sankranthi/Pongal 2017 Bommala Koluvu/Golu pictures. It is my 3rd year display and I am so happy that the dolls are increasing and the steps/padi are filling up well. Like every year, last couple of months have been busy preparing handmade dolls. Just not the dolls but it took a lot of thought and effort for the golu backdrop. So, this year for a change, I used a pattu (silk) Indian dress chunni as the main backdrop and added some lights, party streamer garland, foam leaf toram and clay mural kalash . And on both sides I have used floor standing candle pillars and replaced the candle with a a handmade paper lantern ( that I made for Diwali). (tutorial coming soon) Also, this year theme is 5 stories related to Krishna’s childhood. I already have “Krishna, balarama and friends eating butter” doll set that I made to display @ local Hindu temple on “Janmasthami 2015”. The basket and krishna are made of polymer clay! And the snake(vasuki) is air dry clay and painted the details with some acrylic paint. Vasudeva is a male doll make over – added red dhoti, some brown beads. For the beard and hair used some black felt. Kubera sons are again the same male doll as vasudeva and I dressed them up as prince with some gold lace from hobby lobby and the crown is made of gold foam sheet. The 2 trees are made of cardstock. Krishna and the tree backdrop is from last year Janmasthami – here is the link to make the cardboard tree. Hope you all enjoy this virtual display of our golu/koluvu. Nima on Ganesh pooja 2016 ! Varshini on Ganesh pooja 2016 ! 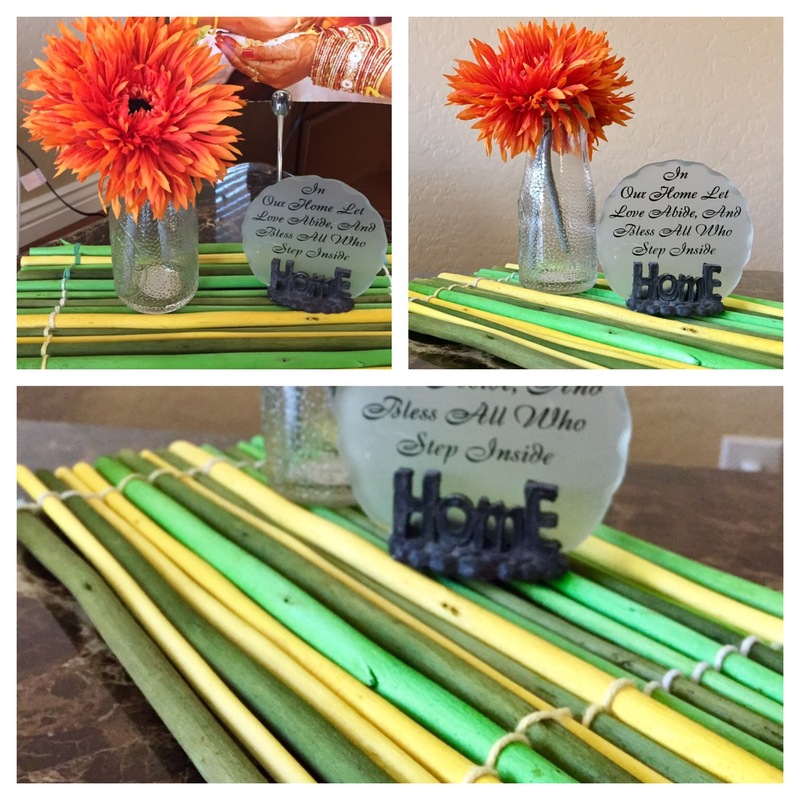 Nima on DIY Return Gifts!! Tripura on DIY Return Gifts! !